Snapshot: The Weber Baby Q Premium (Q1200) portable barbecue has a small cooking area but no side burner. How well does it cook? Tested with the optional $40 breakfast plate. The Weber Q1000, which is available at all Weber stockists, is expected to perform similarly to the Q1200. 10 Nov 2018, Brian K.
We are retired and I cook every night on it. It is quick and the food is always perfect. Will try a roast on it soon. Have only had it a few weeks. Our one will take either a gas canister or a gas bottle. I bought some canisters at Bunnings for $14.95, elsewhere $20 or $25 . However I only get four lots of steak or chops from one canister. Will invest in a 9kg gas bottle. However the small canisters will be great for a picnic. On youtube they use small canisters in USA but there they are only a few dollars. 07 Mar 2018, Malcolm W.
Unfortunately one has to be careful that the hose is away from the unit before lighting. This problem can be avoided by purchasing a trolley. 26 Nov 2017, Tricia R.
We have had our Weber Baby Q now for over 5 years and have found it to be so easy to use and a great little bbq to cook our meat, chicken or sausages nearly every night of the week now. We have found that it is better using the bbq for a roast than the electric oven and it is even more delicious and juicy. Win win all the way. Have even taken it camping with us. "The best and easiest to use bbq !" 08 Nov 2017, Doug L.
We mainly cook steak, and chops, but have also cooked a roast leg of lamb. Always perfect consistent results. Also the single burner uses little gas. The compact size is deceiving - can easily cook for 4 adults. Is Easy to clean as most parts can fit into dishwasher. 23 Jul 2015, John W.
Our old 3 burner Captain Cooker (BBQ Factory) was getting past its prime and we needed a smaller BBQ so I went on-line and checked the reviews. We bought the Webber Baby Q 1200 because of its write ups and its size. It has been a little cracker! I'd call it a BBQ/Oven. I have cooked everything from pork roasts to Pizza, roast veges to home made bread/buns and I'm yet to have a failure. You could cook for four people but for two it is spot on and certainly does not use as much gas as the 3 burner. Get the one with the thermometer and the raised lid. Roasts a whole chicken perfectly. The plastic stand Webber recommend for the Baby Q 1200 is silly. I bought a fold up camping table for our one; much more stable and useful. Didn't like the disposable aluminium trays that go between the roasting rack and the grill so made two more robust ones (to the same dimensions/hole pattern) out of an old aluminium oven tray - reusable and washable. I had a battle for the first couple of months trying to keep the cream coloured lid clean as it gets very hot and easily bakes on any residues. My advice is don't bother cleaning it; I see a mat black lid option now, go for that. "In love with my baby Q"
17 Jul 2015, Jackie D.
It's not a monster on our deck. it's perfect for two but we can also prepare part of a meal when we are having lots of people over. We use it all year round although less so mid winter. I recommend you get the one with the temperature gauge. I'm trying to think of one..... BF said, the volume inside is small which means it heats quickly but the heat dissipates quickly when the lid is open. 23 Nov 2014, Arthur William C.
We're a retired couple and use our Baby Q 120 frequently. It copes easily for four people and more (depending on what is being cooked). The likes of a butterflied leg of lamb, whole chicken or similar largish pieces are breeze. Is cleaning a mission? Not with the Baby Q 120. The lid, when detached from base fits into the dishwasher with no problems (remove the thermometer) and likewise the base (unscrew from the frame). The grate also fits into the dishwasher (remove any larger scraps of burnt on food). Putting a wind shield (a piece of heavy duty aluminium foil folded in half)on the windward side between the side table and side vent of the lid ensures temperature does not fluctuate if a breeze is blowing. 04 Oct 2014, Bruce G.
I had a Q 120 for about 8 plus years and decided to replace it with the Q 1200 which is basically the same, but I found the split grate fine easier for cleaning and the trolly a bit more difficult for some to get together I can get about 270 C in about 15 minutes. 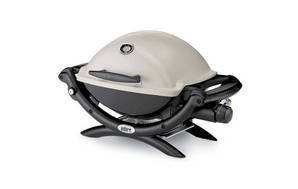 "Baby Q - Small but powerful........."
Perfect BBQ for blokes who can't cook - pop the food in, close the lid, stick to the recommended cooking time (it's that simple) and you can't miss - I love it. Small cooking area is NOT a problem as it cooks so fast - can easily handle food for 4-6 people. We got 26 sausages on at once and 8 mins later they were all done! It WILL cook a whole chook, if you get the model with the high lid, and you don't even have to turn it over - you need to use a trivet tho. It's very economical with the gas, and the food tastes simply great. There's no built-in "keep warm" rack but if you need to, bung any cooked stuff into a Supermarket chilly bag - works wonderfully.